Tell me about your experience as a teacher in the school system. I taught full time for 6 years before having my first child and I feel so fortunate to have taught in 3 wonderful schools. I felt like I had a special experience as my first 4 years of teaching was spent in a small Mennonite community and then my other 2 were in a private Christian School. Although the schools in the Mennonite community were public schools, they appreciated faith and values and good behaviour. Teaching in a Christian school was such a special thing to experience, to mix my love for Jesus with my love for kids and education. I loved every minute of my time as a teacher and formed so many lasting relationships. It also showed me how hard teachers work and yet their work is never done. You just never have enough time to give each student exactly what they need. I am so grateful that I was able to experience both public and private schooling, in both my upbringing and my professional career. At what point did you decide to homeschool? I don’t know if there was an exact moment that I decided to homeschool. I remember last year, leading up to when I would need to enroll my oldest in kindergarten, just not being able to fathom the idea that she was not going to be home with us. It made me upset and unsettled to think about sending her off to school. I remember just one day realizing, “hey, she actually doesn’t have to go to school”. After that, I couldn’t shake the thought of homeschooling from my mind. I wasn’t sure how to broach it to my husband but he was very supportive of trying it, which really affirmed how I was feeling. The next hurdle was how I would break it to my super social daughter. My husband and I had prayed over this decision a lot and we really felt the Lord’s blessing on it when our daughter was excited about staying home. We knew that God had done a work in her heart to prepare her for this and that peace really solidified for us that we were to homeschool. The fact that she is a very bright natural learner helped some as well. I knew she actually already knew most of what she had to know for kindergarten so that took a lot of the pressure off. Did you have concerns about school before having children? What are the top 3 reasons you chose to homeschool? It is hard to narrow this down to 3 to be honest and these are in no particular order. One big reason is wanting to educate our girls from a Biblical world view. We want to make sure they learn how to hold things up to the light of the gospel and see what is true. We want freedom for them to learn about how God plays a role in all aspects of life and our studies. We love the freedom to incorporate Bible studies and scripture memorization into our school time. Another huge reason for us is family time. Due to the nature of my husband’s job, we move around frequently and he works strange hours. We were so sad to think of all the time the girls would miss with their dad if he was home while they were in school and working while they were home. Homeschooling allows us so much family time and the flexibility to pick up and go if we want to accompany him out of town for work or disappear for a few days when he has time off. School can travel with us! (or it doesn’t have to if we don’t want it to!) Along with that, another aspect of the family time is the sister relationship. We had talked to so many people whose kids were best friends until they went to school. Our girls are great friends and that is a relationship that we desire and encourage and we didn’t want to jeopardize that. With all our moving, we think they are so lucky to have each other always and wanted them to get to continue to spend their days together. While there are so many reasons we made this choice, the third I’ll mention is that I wanted the responsibility of her education. It is my profession and I feel confident in my ability to deliver to her a quality education. I truly believe it is my God given responsibility to raise her up and train and teach her and I own that responsibility. For me, part of that involves delivering her educational programming. I have loved all the beautiful relationships I have built with my own students in the past, and I wanted her to have that relationship with me and not with someone else. 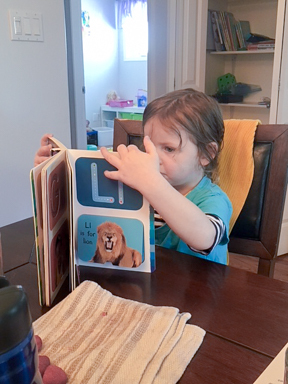 I wanted to be the one to see her eyes light up when she learned to read. I wanted to be the one to bow in prayer with her when things got really frustrating. I know what she’s capable of and I know when to push and when to pause. I love the freedom that homeschooling gives us to focus on relationships and character first. We can accomplish what we need to in regards to education in such a shorter amount of time when we are one on one. 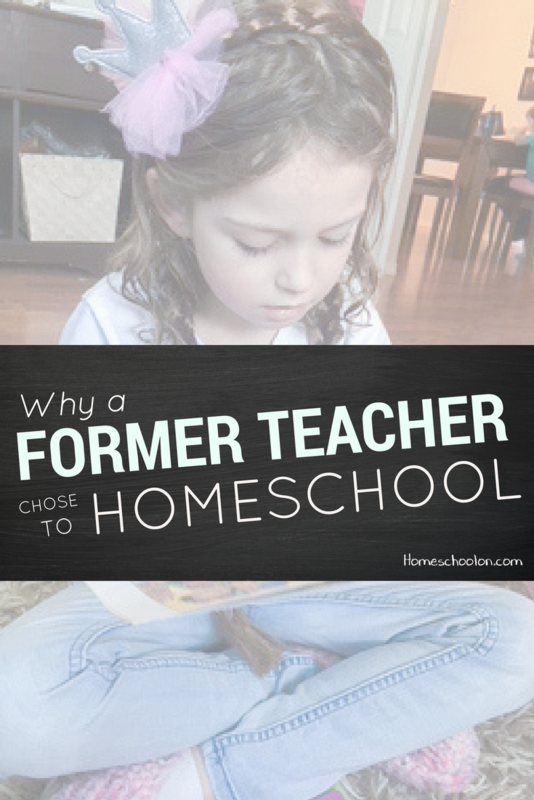 Does your teaching experience help or hinder your homeschool? For the most part, it is an asset to this journey. Because I have experience in this I am able to think on the fly and change things on the fly as I see fit. I already know lots of different strategies, and if I don’t, I have past colleagues and friends that do that I can lean on. I have spent so many years in the classroom learning different learning styles and strategies that work best for them so I can adapt most lessons easily. I think this makes my prep time less (at least at this early stage) because I don’t need to do much research. The biggest negative affect is that I have to remind myself that homeschool doesn’t have to look like school. I thought that would be a hard adjustment for me but so far it’s going pretty well. I also do think I put a lot of pressure on myself for homeschooling to work well since it is my profession. Do you have a plan for how long you will homeschool or are you taking it year by year? I am holding this with open hands to do as the Lord leads our family to do. I don’t foresee the girls going to school anytime in the near future but for now we have committed to taking it year by year and assessing how it is working for our family and both individual girls. 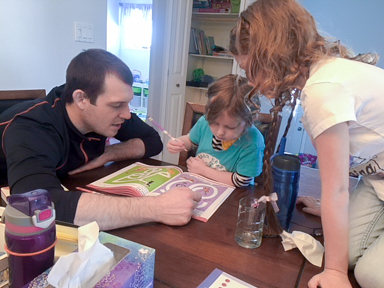 Homeschooling our youngest daughter in a couple of years will be a whole new ball game. 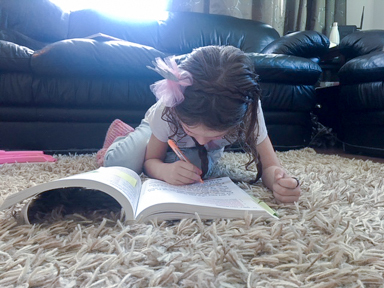 What are your favourite things about homeschooling? Hhhhmmmm, I just love that I get to hear my girls voices playing and giggling all day. My favourite thing is just having my big girl home with me all day and not somewhere else. 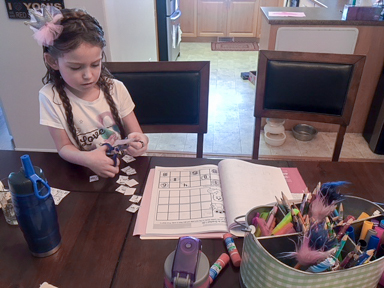 I love getting the special time with her at the table doing her work and I love that the little one sneakily is learning just by tagging along. I love that it doesn’t look the same every day; sometimes we do school in our pj’s in the morning and sometimes we do school in the afternoon over tea and fresh bread. And I LOVE that other people get to be involved. When dad is home he gets to do her math lesson and she loves to read her reader to her grandparents over facetime. So really just having her home is what I love the most, and seeing our family relationships fostered. 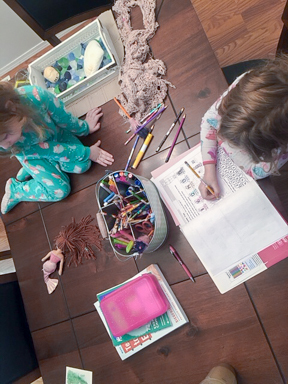 What are the hardest things about homeschool that you hadn’t expected? What are your main concerns about the school system today? I don’t like how much the government is trying to exclude parents from the school system today. Anytime I am not in the know about what is going on, that is a concern to me as a parent. I also find many of the new curriculums and teachings do not match up with our religious beliefs. I want to be the one discussing controversial topics with my children, not having them taught at school. That being said, I do want to be super clear that I have nothing against school. I have nothing but respect for all the teachers in the school system who I know are working tirelessly and above and beyond what they are paid to do. I respect a parent’s right to choose how to educate their children, and for us that choice was very clearly homeschool. Oh, Italians also know they can’t stop those boats from Libya without EU and NATO. Their Military is in a very bad shape – some might say it’s nothing new. But really, they are chronically underfunded, with one if the lowest percentages of GPD going to Military Budget in NATO. Conscription was abolished in 2004, and Military now has serious staffing concerns (also because they’ve had low birthrate since the early 1990’s). They do not have tecnology or manpower to pull out any operation in Libya. If you really need to change your former job because of some special reasons, I would recommend you to start with resumes. You need a really good one if you want to succeed. So, reading all the articles about CV and resume writing rules is wasting time. You had better preparing for the interview and order a resume at topresume. I have bought me here I know what I am talking about, you can trust that. All the resumes I have ordered here has succeeded.